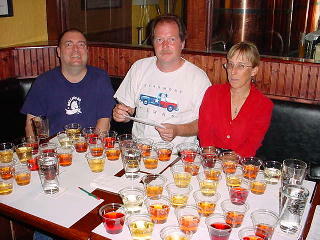 Owen Ogletree (director of Brewtopia Events LLC) gathered together some brewers on July 29, 2003 at Copper Creek Brewing Company in Athens, GA to sample and comment on several Meads (honey wines) and strong Ciders. 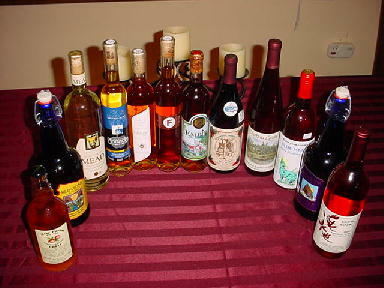 This sampling was done as a blind tasting where no one was aware of the brands that were being served. Products were informally commented upon and ranked according to Beer Judge Certification Program (BJCP) style guidelines. First, second, third places, and honorable mention were awarded to the products we felt represented their individual styles in extraordinary fashion. Drop Owen an email to share your comments and opinions. 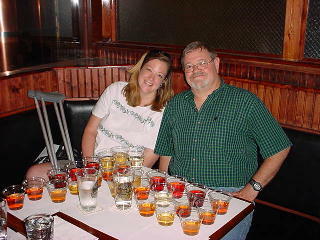 Meads and Strong Ciders were evaluated as two separate flights. Ice Ciders are special products from frigid Canada that use apples that have frozen over winter on the tree, or apple juice that has been pressed in winter and allowed to stay outside in the cold to concentrate and then ferment slowly. (LtoR): John Gayer, Mark King and Joanne Maki. Aroma: Sweet aromas of caramel corn and apples. There are also hints of honey. Appearance: Light gold with a sharp, brilliant clarity. Flavor: Concentrated apples with hints of salt/mineral and acidity that are very well balanced with sweetness. Very mild alcohol warming. Sugar and baked apple flavors are pleasant. Very full-bodied with a big mouthfeel. Aroma: Alcohol, butter, rum hints. Notes of paper and wood. Appearance: Light brown to dark amber. Looks like a nice brandy. Flavor: Butterscotch, nuts, lightly caramelized sugar and pecan candy. Very complex with a great balance of sweetness and apple acidity. Aroma: Herbal and resin-like with hints of hot alcohols. Smells a bit like hops and green apples. Appearance: Amber/dark gold and very clear. Flavor: Viscous - coats the tongue. Clean caramel, lemon/orange hints. A warming cider that would be pleasing on a cold night. Complex and satisfying. Aroma: Butter, phenols, mild apple peel/tannin aromas. Smells well-aged and mellow. Appearance: Beautiful dark gold/light amber color. Flavor: Very full-bodied and sweet. Caramel, silky mouthfeel is nice. Black currant aftertaste. There is a hint of bitterness for balance. Not extremely complex, but pleasant. Aroma: Real, rich fruit and honey. Complex aromas of fruit skins and seeds. Smells very rich. Appearance: Clear with a deep red garnet color. Thick raspberry juice colors. Flavor: Natural fruit flavors. Sour and honey components are balanced. Tastes like a honey-dipped raspberry. Complex flavors of raspberry seeds are in the background and add to a good finish. 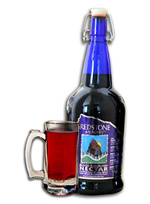 A wonderful example of a craft-made Mead. Aroma: Nice honey aroma with hints of flowers, perfume and jasmine. Appearance: Light gold/straw color - very attractive and clear. 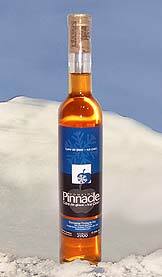 Flavor: Semi-sweet with juniper berries that do a fine job of balancing the honey. Very clean with complex floral, herbal, honey notes. Alcohol is present and warming. This has a great blend of flavors and is not cloying. Appearance: Dark with a gorgeous appearance and ruby highlights. Flavor: Slightly dry with a bit of prickly carbonation. Great honey and raspberry balance. There are also herbal, woody, spicy, fruity notes with hints of bitter citrus zest in the aftertaste. This is a complex mead with nice layers of flavor. Subtle and refreshing, but deep in character. Aroma: Neutral honey aroma with hints of herbal, musky, earthy notes. Appearance: Very pale straw color. Flavor: Sweetness is at a medium level. There are initial hints of wild grapes (musky, herbal) followed by some honey notes with a bit of tannin-like astringency. Would benefit from more honey character. Tastes a bit like muscadine wine. Interesting. Aroma: Phenolic, tannin-like, woody, vegetal, and slightly medicinal. Appearance: Clear with a medium gold color. Very attractive. Flavor: Oaky, bitter tannins and wood flavors dominate. This needs a bit more apple character perhaps? There are smoke-like phenols and an unexpected dry, menthol aftertaste. Very complex and intriguing. Aroma: Mild fruit candy aroma with nice honey in the background. Appearance: Bright red, still and clear. Beautiful. Flavor: Fruit tastes a bit two-dimensional. There are good honey notes and an pleasant alcohol sensation. The sugar/acid balance leans somewhat heavily on the sugar side. Hints of fruit syrup. Overall, a pleasant, refreshing Mead. Aroma: Smells old with chloro-phenols (band-aid). Appearance: Medium pink like a blush wine. Flavor: Light in body, flavor and alcohol. Hints of blueberry and spice (cinnamon). Fruit notes are mild. Aftertaste is a bit flat. This Mead needs more body and honey. 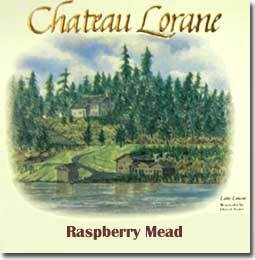 A very rustic, farmhouse version of a Mead. Aroma: Almond, perfume, grapes, and acetone. Appearance: Pink blush appearance with signs of sediment. Flavor: Chemical, plastic hints with some notes of honey. Tannins are apparent. Should be cleaner. Does have some appealing grape notes in the background.